Accused New York and New Jersey bomber Ahmad Rahami appears to have acted alone, the head of the FBI's Newark office said on Tuesday. In an exclusive interview with NBC New York chief investigative reporter Jonathan Dienst, Special Agent in Charge Timothy Gallagher also said law enforcement investigated Rahami in 2014 and found no evidence to suggest a tie to terrorism. "At this time, we have no information that his family members or for that matter anyone in the general public knew about these attacks in advance," Gallagher said. Rahami faces five counts of attempted murder following a shoot-out with police in Linden, New Jersey on Monday. Federal charges related to the bombings in Seaside Park and Manhattan last weekend were filed Tuesday night. 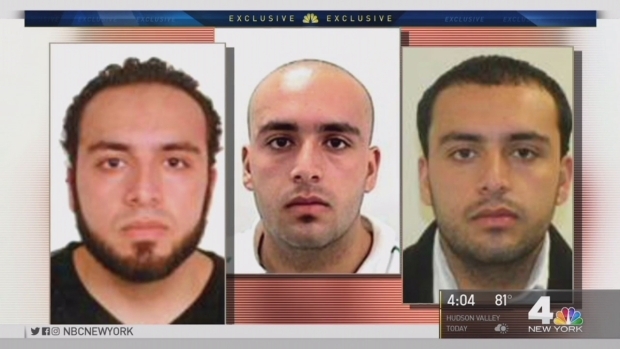 Accused New York and New Jersey bomber Ahmad Rahami appears to have acted alone, the head of the FBI's Newark office told Chief Investigative Reporter Jonathan Dienst exclusively on Tuesday. Gallagher said the FBI does not yet know why Rahami allegedly chose the locations he did, though he suggested that anyone looking to cause harm will choose highly trafficked areas - like a road race or a bustling New York City street. Gallagher also downplayed reports that Rahami's father called him a terrorist in 2014. Mohammed Rahami told NBC on Tuesday that the FBI "didn't do their job" after he made the accusation against his son. "The FBI Newark office received information about this individual. We conducted an extensive investigation to include interviews, querying databases both that we have and that our partner agencies have ... at the end of the day there was nothing to indicate any nefarious activity or that this individual was a terrorist," he said, adding that Mohammed Rahami ultimately recanted the allegations against his son.